Whenever I blog about food on here, about half the time I'm writing about some great burger I had. What can I say--I'm a burger man. Last night, after attending the Fourth Annual Red Pump/Red Tie Affair at Levine Museum of the New South (put on by The Red Pump Project-Charlotte in recognition of World AIDS Day), I was hungry, it was about 10 p.m., and I had a little time to spare before I was going to walk around the corner to the after-party at Re:Public nightclub. Also within that block, the area around Seventh Street Station, is Queen City Q, so I popped into the restaurant for some quick eats. Open since February, Queen City Q has quickly become one of Charlotte's top barbecue restaurants. I've enjoyed the barbecue there a few times and whenever out-of-towners ask me where they should go to get some good BBQ in Charlotte, the Q is one of the places I recommend. But last night, barbecue would've been too heavy on the stomach in the middle of a night out. So I opted for a burger, and I made the right choice. I ordered the All-American Burger, comprised of a grind of beef brisket, porterhouse, and chuck; topped with provolone cheese, bacon, lettuce, and tomato (I asked them to hold the onion); along with a side of sweet potato fries ($10). 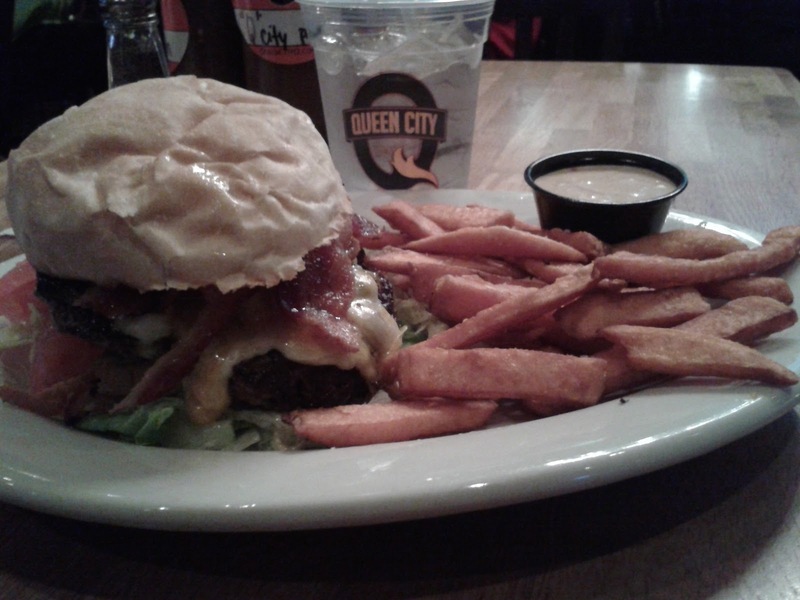 It was juicy, tender, and flavorful--just the way I like my burgers--and proves that Queen City Q does more than cook good barbecue. Queen City Q, 225 E. Sixth St., Suite A, 704-334-TheQ (8437), www.queencityq.com; parking is validated for the Seventh Street Station parking deck.